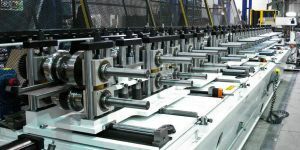 Available in manual and servo adjustable, these lines allow for parts with multiple widths and the same profile edges to be manufactured on the same roll forming line and roll tooling. By moving the outboard stand, the width can be accurately adjusted without any tooling changes. A complete family of parts can be manufactured with a reduced overall cost. 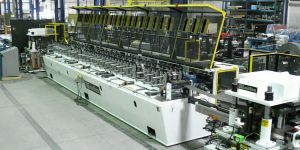 The servo adjust option automates the changeover allowing for even greater accuracy and reduced downtime between parts. Flexible width mill utilizing mechanical pro-notching and flying cut-off system.